CRAZYLOG designs and provides Quickbrain software that enables power plant operators to have control of cost optimisation, preventative maintenance, failure predictions, data management, and performance documentation. Quickbrain is a web-based, Cloud-hosted software to manage and monitor operations at power plants. The solution is split into two main modules. The first is called E-DMS, which is a document management software (DMS) tool specially designed for organising technical documentation of waste management, wastewater treatment, energy, nuclear, and chemistry applications. E-CMMS is the second module, which is computer-aided maintenance management tool that works alongside the E-DMS module. 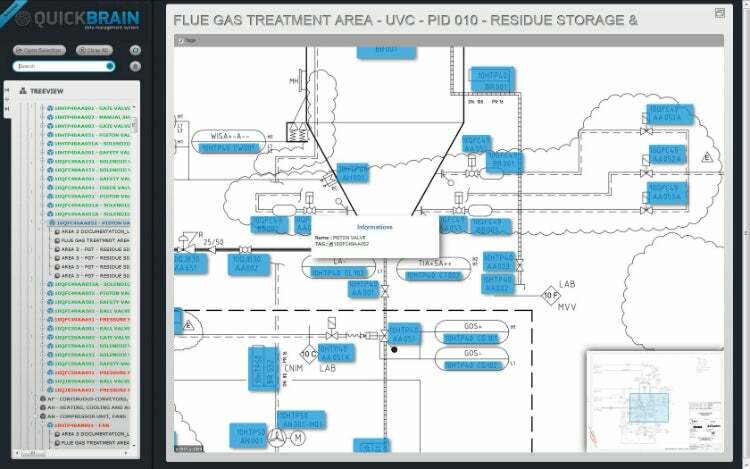 E-DMS allows the users to manage technical documents such as drawings, piping and instrumentation diagrams (P&ID), as well as operations and maintenance manuals. Documents are recorded and organised in different treeviews, while the user can easily copy, paste, and drag and drop files from one location to another. The treeview can be a simple set of folders or can represent all the client’s plant assets with tag designation. This functional treeview can be linked to an existing computerised maintenance management system (CMMS). Each document contains metadata to make it searchable, including text layer indexing for full text search, and can be used with status follow-up and automatic emails sent to the relevant operators. The main strength of CRAZYLOG’s solution is the capability to transform picture files into interactive drawings. This ‘Smart-Drawings’ functionality allows users to find documents relevant to a valve by clicking on its symbol in the P&ID interactive. It is also possible to locate the valve from its location (tag of the valve) in the treeview. Another function the Quickrain DMS module offers is Autolink. This algorithm was designed to analyse any readable document, including its text layer, and extract all the sequence of characters and numbers identified as an equipment tag. The system extracts the ‘smart’ tags that work on the knowledge of the coding structure. From this information, Autolink is then able to compare tags in the document with those in the functional treeview (asset register), which allows for the automatic linking of documents to power plant equipment. Inconsistent tags between the document and the treeview can be identified. Because the algorithm is not a simple ‘like-for-like’ comparison, it is possible to identify tags that are in the document, but not in the asset register, indicating that the document or the asset register needs to be updated. Quickbrain produces full computer-aided maintenance management software with its E-CMMS module. This allows the user to manage the asset register (treeview) and documents for power plant applications. All assets are related to an equipment model that contains preventative maintenance plans, resources, documentation, service instruction, spare parts and tools. The machine maintenance plan for an asset is triggered according to a predetermined schedule or meter reading, and is either recorded manually or connected to a supervisory control and data acquisition (SCADA) solution. Quickbrain uses open platform communications (OPC) and IoT-based connectors for data collection, and all the preventive work orders can be scheduled graphically with an interactive calendar. Workforce allocations are carried out through the selection of tasks and by allocating them to maintenance engineers. Corrective maintenance is initiated by an event (service request) on the equipment itself and an alert is sent if the equipment requires servicing. Action planning supports the maintenance manager to schedule corrective actions and to allocate resources effectively. Predictive maintenance support is given to the operator through a ‘health status’ calculated from an automatic reliability field data analysis algorithm developed by CRAZYLOG’s partner BQR Ltd.
Users of Quickbrain software are able to gather a risk and fail percentage of assets, and the time that the failure could occur is also available. This integrated predictive capability is a unique feature for a low-cost CMMS. Quickbrain E-CMMS includes all the capabilities for stock inventory management with ‘first in, first out’ (FIFO) accountancy mechanism, while spare parts can be combined with the product when an action or a preventive task is assigned. The hours spent on maintenance tasks are recorded through the software solution, with subcontracted services and spare parts usedlogged. In addition, finance key point indicators (KPIs) are generated for each component without any complex reporting tools. Quickbrain is widely used in the energy, waste management and nuclear sectors, by companies such as Veolia, Engie, Airbus Safran Launcher, CNIM, Suez, and STX France. Please contact CRAZYLOG for more information. Power plant data management software developer CRAZYLOG has recently provided ThyssenKrupp Industrial Solutions with its Quickbrain software for managing built engineering documentation delivered to end-customers.